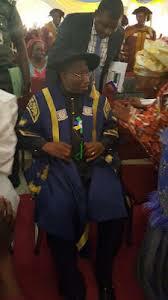 Home / News / Formal President Goodluck Jonathan expresses his readiness to return to the classroom. Formal President Goodluck Jonathan expresses his readiness to return to the classroom. Ex-President Goodluck Jonathan has expressed his readiness to return to the classroom if offered such opportunity, especially at the Ignatius Ajuru University of Education, Port Harcourt. Jonathan disclosed this yesterday while speaking at the 35th and 36th combined convocation ceremony of the Ignatius Ajuru University of Education, Port Harcourt where he was conferred with “Icon of Democracy” award. The former president, who left office in 2015, expressed gratitude to the institution for the honour done to him. He said: “I want to specially thank the Senate of the University for considering my family worthy of double honours, to wit: the conferment of the honour of Icon of Democracy on me and the naming of the new Automated University Library after my wife, Dame Patience Jonathan. “I always attach so much importance to any recognition coming from home because I strongly believe that no prize commands higher value than the one given by the beneficiary’s direct constituency.” Jonathan stated that the visit is like homecoming for him, as a former lecturer in the Rivers State College of Education, which was upgraded to a full-fledged university. The former president said: “Let me also say that I had good job satisfaction here, compared to all the other places I have worked. I know that the only major challenge academic staff face is with the reward system, considering the fact that as a nation, we are yet to get to the point where we pay our teachers the wages they deserve. “However, for all the hindrances teachers face, they derive a fulfilling experience and satisfaction from the special relationship they cultivate with their students.